I can see a fatal pot pizza downward spiral - eat it, get the munchies, eat another, get the munchies, eat another... Although if you gotta go, that's not a bad pathway out of the world. 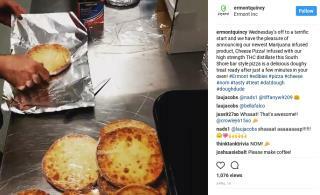 I can see some stoned guy tossing his kitchen over and over, saying "Oh man, I know I had a THC pizza around here somewhere." They should at least offer cheetos as a topping.